Why buy our Australian Cypress flooring & lumber? QUALITY & PRICE. ​​Love It, Buy It! We "know our stuff": We specialize in Australian flooring and lumber species, especially Australian Cypress. That's a lot of focused knowledge. Highest quality possible: We supply only STK grade (Select Tight Knot) Australian Cypress, the highest grade possible. Don't ask us for "cabin grade" or "character grade" - we just don't do it! Superior Finish for silky smooth pre-finished solid flooring: Any raw Australian Cypress floor boards will have voids around the knots and grooves occurring naturally in the wood grain BUT each of our pre-finished flooring boards is filled and sanded before any finish is applied, to eliminate the roughness of those voids and grooves. This produces smooth pre-finished Australian Cypress flooring that is comfortable to walk on in bare feet or socks. Keiki love Australian Cypress, too! 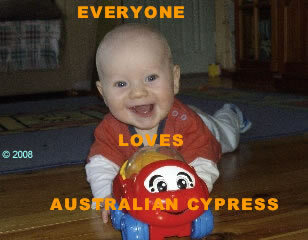 Ethically produced : All our Australian Cypress flooring is Australian Forestry Standard approved. Safe to use: There are no toxic glues used in the production of our solid Australian Cypress flooring, whether pre-finished or unfinished - just solid wood from the trees. Our ﻿engineered﻿ Australian Cypress flooring is carefully manufactured to exacting standards and is safe to use.